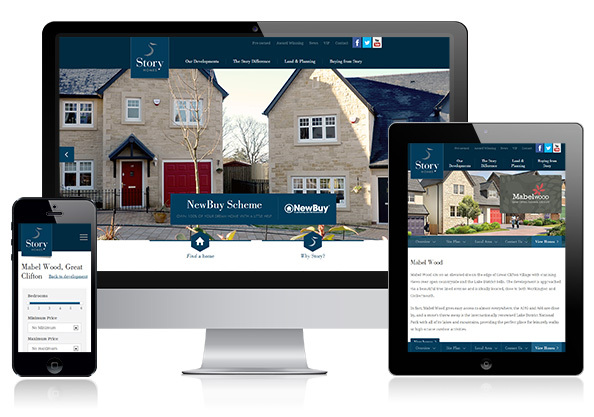 We have recently launched a new website for Carlisle-based developer Story Homes. The company, having recently undergone a full re-brand, required a new website that was consistent with their new branding and to help reflect the quality of the contemporary, aspirational homes that they build. Following a competitive tender process, we began work on the project in January of this year. We worked closely with several members of the Story Homes team throughout the project, including personnel in their marketing, sales and PR departments. The staff at Story have a great understanding of what their customers expect from a service point of view, as well as the standard of product they are looking for. This knowledge was invaluable in helping us to design and build the new website. At Union Room, we believe involving clients in the wireframing stage of a project helps to ensure that we produce work that all stakeholders feel happy and involved with. The transparent way in which we approach the planning stage also increases the chances of a smooth transition from wireframing to producing designs. 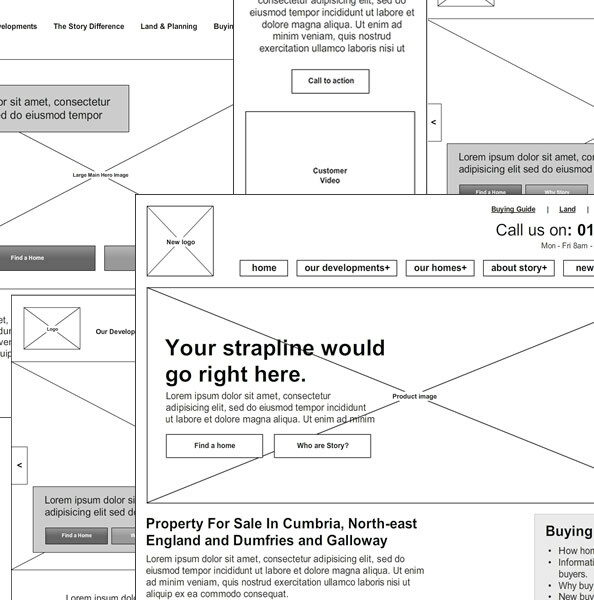 With a general layout agreed, we begin to apply styling to the various elements of our wireframe. Blank squares are replaced with logos and imagery, and we begin testing out various typefaces with a view to testing our favourites directly in the browser to see how they will render when the website is built. As well as the new brand for Story Homes itself, individual brands were created for each of the developments. Including this branding on each development page, alongside unique renders of the location, ensures each of these sections has its own unique look and feel. The website has a number of bespoke features, one being the ability for users to use an interactive site plan map to view property details. Where other development websites tend to use flat graphics or downloadable PDFs, the Story team have spent considerable time plotting out each development to help users quickly and easily find where each plot is on a development. With users visiting the website on a mobile or tablet making up almost 50% of the website’s traffic, providing a usable experience to users on non-desktop devices was a key requirement for the new version of the website. The site has been built responsively, ensuring the layout adapts to the viewing device and browsing environment of the user. The aim of building a website in a responsive way, is to make a website that works well across thousands of different possible screen sizes and dimensions without the need for multiple versions of a site. For more information on our approach to responsive design, please get in touch. As our build process increases to consider more devices, browsers and screen sizes, so have our testing processes. We now regularly test our websites on a range of desktop, tablet and mobile devices to ensure compatibility across various screen sizes, browsers and platforms. The new website is fully content manageable via a WordPress installation that we have customised to suit the Story team’s needs. This includes the ability to add, edit and delete new developments, local area pointers to maps, control the property types across the website and also edit basic page content across most sections of the site. “A new website is an essential component of the Story Homes strategy of growing our business as it is an increasingly key source of sales activity & a vitally important way to promote the quality of our new homes into new & existing markets. We therefore went through a very rigorous process to select a web designer that would meet our aspirations of providing a first class web experience for our customers & key stakeholders. Union Room have exceeded our expectations in terms of their ability to deliver a top class new site, on time & to budget & with a real customer focus to ensure the finished product met the detailed specification & in many areas exceeded this specification in terms of functionality & ease of use. View the new Story Homes website.